http://dsssbonline.nic.in. Application link available from 01st Nov,2017 till 21st Nov,2017. Candidates having Degree in relevant discipline qualifications are eligible for DSSSB DASS Grade II Jobs. DSSSB Recruitment selection will be made based on one tier & two tier Examination and Skill test. General/ OBC candidates deposit Rs.100/- as applications fee. Scale of Pay offered for Grade II job is Rs.9300 to 34800/- plus GP of Rs. 4600/-. 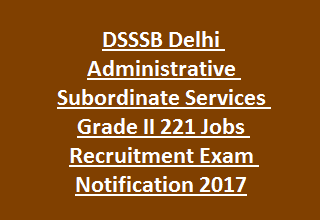 For more information about Qualification, Pay scale, Application Procedure, Salary of Delhi Subordinate Services Selection Board DSSSB Recruitment of DASS Grade II Jobs vacancies are stated below. Name and no of vacancies are given below for this DASS Grade II Jobs in Services Department. Age limit for DASS Grade IV jobs should be between 18 years to 27 years. Age limit for DASS Grade II jobs is 20 years to 27 years. Age relaxations for SC/ ST/ OBC/ PH/ Exsm/ Sports persons applicable as per govt orders. Qualifications for Grade IV jobs is 12th class/ equivalent qualifications with a typing speed of 30 WPM in Hindi or 35 WPM in English on Computer. Qualifications for Grade II jobs is Degree in Arts/ Science/ Commerce or Agriculture from recognized university. Must have knowledge in Hindi. DSSSB Recruitment selection will be made through one tier & two tier Examination and Skill test. General Awareness, General Intelligence & Reasoning Ability, Arithmetical & Numerical ability, Hindi/ English Language & Comprehension. General Intelligence & Reasoning Ability, General Awareness (Same as One Tier but higher level), Quantitative Aptitude, English Language & Comprehension. Tier I Exam is only qualifying purpose, Final selection will made on the basis of marks obtained in Tier II exam. One Tier & Two Tier Exam dates, Pattern are given detailed in the DSSSB notification. Application fee is Rs.100/-for general, OBC candidates. For other category candidates (Woman/ SC/ ST/ PH/ Ex-serviceman) application fee is nil. Eligible applicants read the important instructions clearly to apply for DSSSB Jobs. Applications available at DSSSB Official website http://dsssbonline.nic.in. Candidates select the concerned posts and submit with self- attested copies of required certificates before 21-11-2017.